Smoothies & Snacks in The Valley! 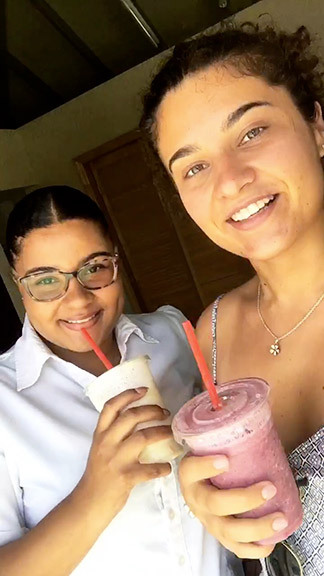 "On a warm Anguilla day, what better way to beat the heat than with a cool smoothie treat?" Louise and I thought as we drove through The Valley, eyeing a spot that's been on the tips of everyone's tongues since it opened. 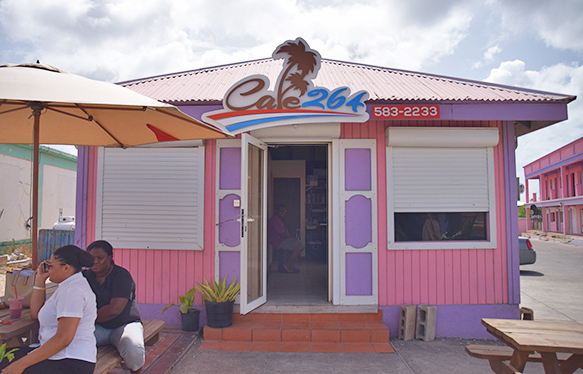 Located in the heart of The Valley, adjacent to the National Caribbean Commercial Bank and FLOW lies Cafe 264. 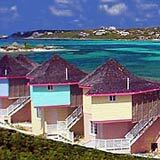 Convenience is not an issue for this little gem tucked in Anguilla's capital! With adequate parking and an overall friendly nature, Cafe 264 is on the rise to being a real pit stop favorite for locals and visitors alike. 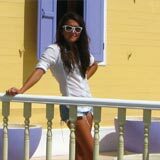 Just a few yards from the main road, you can't miss Cafe 264 with its brightly painted pink and purple wooden structure. The cafe is neatly surrounded by wooden benches with large umbrellas bearing shade to all customers. A lovely spot to indulge on Cafe 264's smoothies and snacks. Cafe 264 is famous around town for its endless selection of drinks. They are one of the few smoothie spots on the island that offers up ingredients like flax seeds, hemp seeds and chia seeds. And, if it's coffee you're after, they are in no short supply of options to keep you caffeinated throughout the day! One look at the menu and its creativity jumps out at you. Reading the menus is fun. Especially the smoothie section! 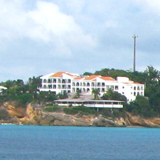 All of their smoothies are named after features and places unique to Anguilla. Based on the fruit combos, I wanted to try everything to see if the smoothies' pun-like names would match the taste left on my taste buds. It was such a tough decision that Louise created a poll on our Instagram page so everyone could vote and help with the oh-so-difficult smoothie selection. 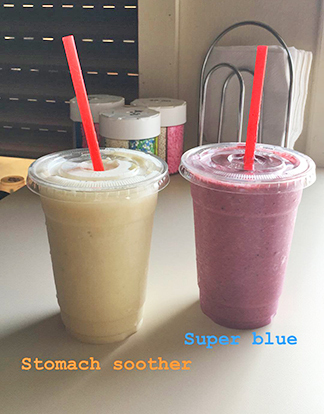 In popular demand, the "Super Blue" smoothie won out at 61%, "Stomach Soother" smoothie was a close second. Super Blue and Stomach Smoother! The "Super Blue" richly consists of blended blueberries, raspberries, ginger, apple and lemon. Banana, yogurt, vanilla and ginger make the "Stomach Soother" as soothing as it is. The open environment of the cafe is refreshing. Your smoothies are made right in front of you. Something about hearing the blender go heightens the thrill of sipping it down. We eagerly sipped on our smoothies as if dear life depended on just a taste. Happy smoothie sippers we were! As we sipped we chatted with Ms. Ongel, the sole proprietor of Cafe 264. A woman with drive and initiative, who is as humble as can be, she's an inspiring lady with big plans. Her goal is to open smoothie shops throughout the islands, sharing her passion with all Caribbean nationals. 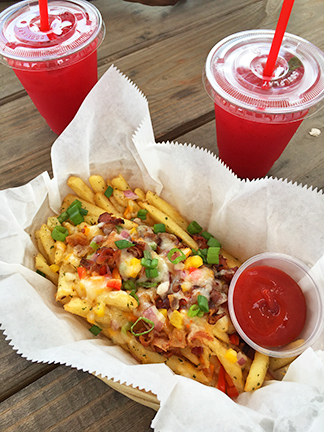 The parsley-painted fries are perfectly prepared. Decorated like confetti with yellow, red and green peppers, sprinkled with cheddar cheese, melting over the brown, crisp bacon... my mouth is watering as I type this! 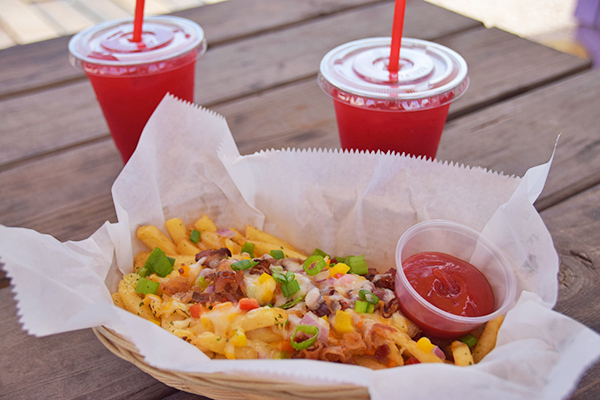 This basket of fries bursts with flavor. Louise and I opted for raspberry punch drinks to wash down our indulgent treat. Chilled and fresh, fresh-picked mint and sliced lime floats to the top. These extra touches give it that extra-fresh feel and taste. From smoothies, to snacks, to Ms. Ongel herself, Cafe 264 is a delight. 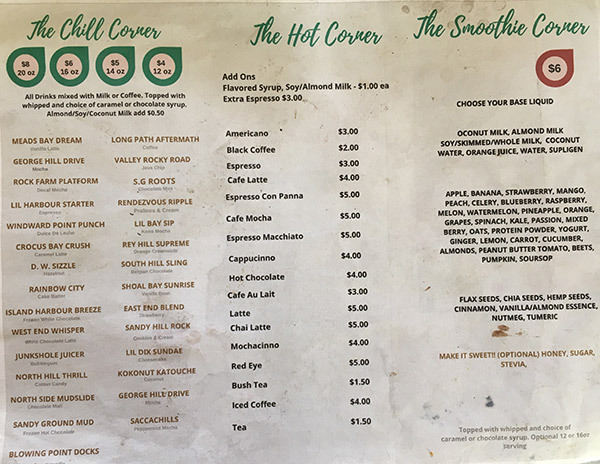 If you are in The Valley and looking for a healthy smoothie sip, a quick coffee or a satisfying, convenient and inexpensive bite, drop into Cafe 264. Directions: Located across from National Caribbean Commercial Bank in The Valley. Hours: Mon to Fri 7am-6pm, Sat 8am-6pm, Sunday closed.